If terminal boots by network and fails to find it's individual configuration file on server, it stops to work, sends you notification that it's unconfigured and requires to create configuration file for this terminal. You can change this behaviour. You can create default configuration file either for all the terminals or for the terminals from selected subnet. Create group for the terminals you need, then in terminals list find corresponding line and create default group configuration. After that new terminal from this group automatically will be configured: it won't send you any notifications and will download the configuration you created. Group is specified by subnet IP and mask. You create config from this group, i.e. for terminals from this subnet, and when new terminal boots and there's no configuration for it on server, then TFTP will download config for this group, default individual configuration file for all the new unconfigured terminals in selected subnet. Firstly specify group number in 16-hexadecimal format — 03. Possible numbers are from 01 to ff. Then configuration of the group 03 will be stored in folder FF.FF.FF.FF.FF.03 in Terminals directory. Then specify network parameters — IP and mask — 10.1.1.0/24. "Remote offices" — name of group. Using this name you can find this group in terminals' list in graphic configurator. TFTP-server downloads this configuration as default individual configuration file for the terminals in 10.1.1.0/24 subnet, that have no their own individual configuration file. Group for 192.168.1.0/16 subnet. Configuration is stored in FF.FF.FF.FF.FF.0d directory. 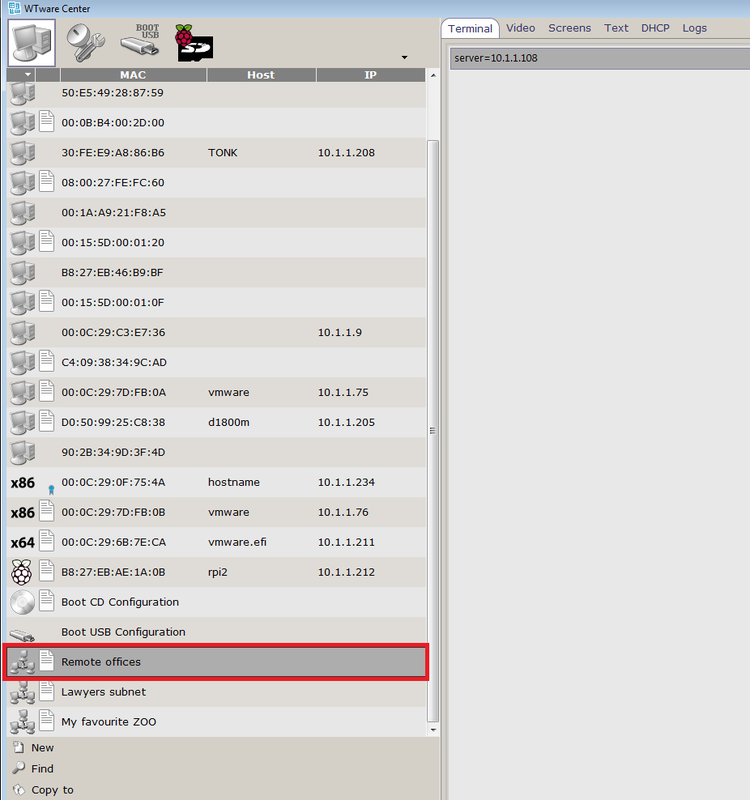 In configurator's terminals list you can find it named as "Lawyers subnet". Also there's group "All". You may create config for all terminals, that are not from subnets for specified groups. Or you may create only one group "All", then any new unconfigured terminal, connecting to terminal server, will download configuration for this "All" group. Появились комментарии, поправки к этой статье? Пожалуйста, напишите в форум!